Swiss Bianco Canada is an authorized Canadian dealer for Victorinox Swiss Army Knives (including spare parts and accessories ). If you live in Canada and would like to purchase any of the products listed below or any other Victorinox Swiss Army Knives or accessories, please submit your request through the Contact Us Form. Please list the items you are interested in, along with your postal code, so that we can calculate shipping cost and taxes (GST or HST, depending on your province of residence). We will respond with a PayPal invoice for the items you ordered. All of the products listed on this page are eligible for free Canada-wide shipping on orders of $100 or more, as well as free shipping and no sales tax on orders of $200 or more. SwissTool™ and SwissTool™ Spirit Accessories. 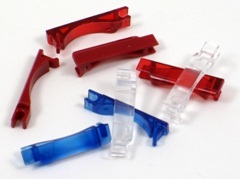 Make your SwissTool™ into a "Plus" version by adding these accessories. Wrench (Item# 30540), Bit Holder (Item# 30541), Corkscrew (Item# 30555), and Mini-screwdriver (Item# 30411): $28 for the set. 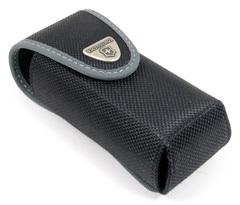 Nylon Pouch for SwissTool™ Plus (Item# 30542, grey trim) or Swiss Tool Spirit (Item# 30262, brown trim): $20 (pouch only) or $45 (loaded with Wrench, Bit Holder, Corkscrew, and Mini-Screwdriver). Note: We do not carry standard 1/4" bits, as they can be purchased at any hardware store, allowing you to build your bit set to your preference. Red 91mm Cellidor Scales Victorinox 91mm Cellidor Scales: Sapphire, Ruby (availability may change). $12 per set. 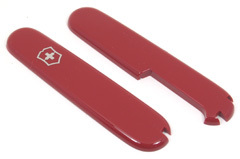 Victorinox 84mm Nylon Scales: Red (without printed Victorinox shield, availability may change). $12 per set. Victorinox 111mm Nylon Scales: Black for Liner-Lock models, Red for Slider-lock and Liner-lock models, availability may change). $12 per set. 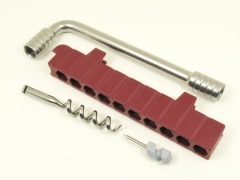 Replacement parts for Victorinox Rescue Tool. 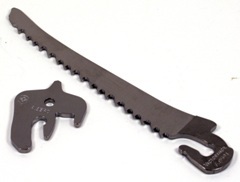 Window Breaker (part A.8590) and Disc Saw (part A.8591): $8.00 for the set. 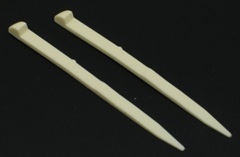 Toothpick Small (30413, A.6141): $1.00 each. 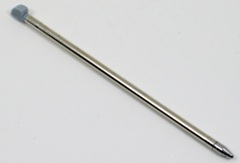 Toothpick Large (30414, A.3641): $1.00 each. 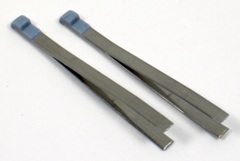 Tweezers Small (30415, A.6142): $2.00 each. 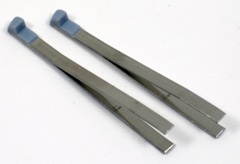 Tweezers Large (30416, A.3642): $2.00 each. 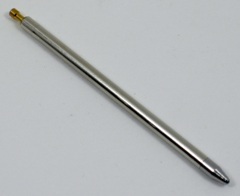 91mm SAK Ballpoint Pen (30422): $4.50 each. SwissCard Pen (A.6444, 30523): $4.50 each. 58mm SAK Ballpoint Pen (30424, 4.0567.32): $4.50 each. Battery door covers: $1.00 each. Please note: Our minimum total order size is $10. E.&O. E.: We make best efforts to maintain accurate product descriptions, stock availability, and pricing on our web site; however, errors and omissions may occur. We reserve the right to make necessary corrections and modify or cancel orders.